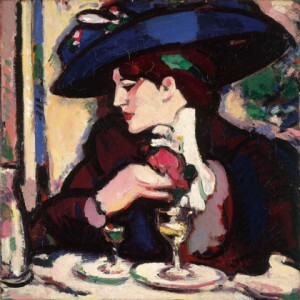 J.D Fergusson was one of the four artists known as the Scottish Colourists, along with F. C. B. Cadell, G. L. Hunter and S. J. Peploe. Fergusson had the most international reputation and was the longest-lived of the group. His career spanned the birth of modern art in Paris before World War One to re-vitalising the arts scene in Glasgow after the outbreak of World War Two. Fergusson is most celebrated for his depictions of women. Images of Edwardian elegance in the early 1900s gave way to startling nudes in Paris from 1910. After meeting the dance pioneer Margaret Morris in 1913, she and her pupils became a source of inspiration for the rest of Fergusson’s life. Less well-known are the sculptures which Fergusson made and exhibited for over thirty-five years. He also painted landscapes throughout his career, in Scotland, England and France: series based on Portsmouth Docks of 1918 and on the Scottish Highlands in 1922 are particularly important. Fergusson was born in Leith, near Edinburgh. Between 1907 and 1939 he lived in Paris and London, before settling in Glasgow, where he died in 1961. His solo exhibitions spanned over fifty years, from London in 1905 to Glasgow in 1957, including three held in America. Fergusson was a tireless champion of contemporary art and of other artists, whether through discussion groups, the written word, exhibiting societies or personal support.